Hepatitis C is an infectious hepatitis caused by hepatitis C virus (HCV).This systemic viral infection predominantly involves the liver hepatocytes and can result in both acute and chronic liver diseases. HCV can also be detected in the peripheral blood, particularly in mononuclear cells. The extrahepatic pool of HCV is the major source of recurrent hepatitis C in orthotopic liver transplant recipients. HCV infection can result in both acute and chronic hepatitis. The acute process is most often asymptomatic with a clinically mild course. The clinical symptoms, if present, are similar to those of other acute viral hepatitis, including malaise, nausea, jaundice, and right upper quadrant pain, which typically last for 2-12 weeks. However, fulminant hepatitis is very rare in acute hepatitis C. HCV RNA can be detected in serum via polymerase chain reaction (PCR) as early as a few days following exposure, which is the earliest diagnostic marker. levels of serum aminotransferases become elevated approximately 6-12 weeks after exposure, and anti-HCV enzyme-linked immunoassay (ELISA) test results become positive 8 weeks after exposure. Approximately 80% of patients with acute hepatitis C develop chronic infection that manifests as persistent HCV RNA detected in the blood with or without abnormal liver function test results for more than 6 months. [4, 5] Most patients with chronic hepatitis C have no or only mild symptoms, including fatigue, anorexia, and nausea. Anti-HCV antibody is not protective, and its level does not necessarily remain elevated in patients with chronic hepatitis C.
The histological features of acute hepatitis C differ very little from other acute viral hepatitis. The essential components include inflammatory cell infiltrate and hepatocellular injury with predominantly lobular involvement. Several forms of hepatocyte injury can be seen under light microscopy, including ballooning degeneration (severe swelling), focal necrosis, and acidophil bodies (apoptosis). Acidophil body is a dense eosinophilic hepatocellular debris that is sometimes fragmented. 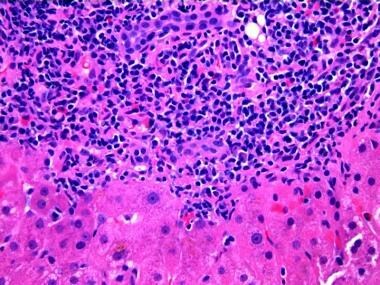 The distribution of hepatocyte injury can be multifocal or panacinar. Severe cases may have confluent hepatocellular necrosis, predominantly in the centrilobular region. Unlike other viral hepatitis, massive hepatocellular necrosis is rarely seen in hepatitis C. The inflammatory infiltrate is composed predominantly of lymphocytes, sometimes plasma cells, eosinophils, neutrophils in the lobules and surrounding dead hepatocytes. The protal tracts always demonstrate some inflammatory infiltrate. In contrast to the predominant portal activity in chronic hepatitis, the portal inflammation is typically proportional to or less than the lobular activity in acute hepatitis. The inflammatory infiltrate is composed of lymphocytes, plasma cells, eosinophils, and neutrophils. In addition, cholestasis, Kupffer cell activation, endotheliitis, bile duct injury, ductular reaction, hepatocele regeneration, and mild fatty changes can also be seen. In contrast to the lobular activity in acute hepatitis, the portal activity is the predominant histologic picture in chronic hepatitis C. The most characteristic feature of chronic hepatitis is the lymphoid aggregate or follicle in the portal tract. 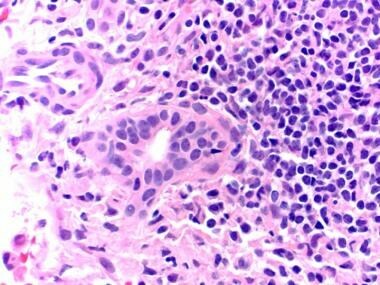 Lymphoid aggregate in portal tract. Although lymphoid follicle is not highly specific, it is much more common and prominent in hepatitis C than other viral hepatitis. The inflammatory infiltrate is composed of predominantly lymphocytes and plasma cell, which is confined to the portal tract in the mild form of hepatitis. Interlobular bile ducts are often damaged, as manifested by lymphocytic infiltration within the ductal wall, nuclear crowding, and intracytoplasmic vacuoles in the ductal epithelial cells. Bile ductal injury in a patient with hepatitis C virus. In the more severe cases, the portal inflammation extends into the adjacent periportal parenchyma and results in hepatocyte injury at the interface (interface hepatitis). 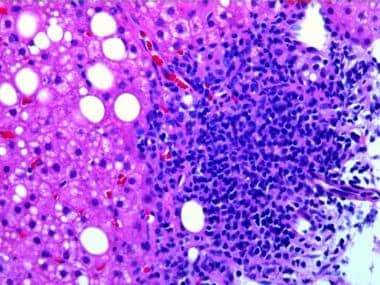 Interface hepatitis can be easily identified by the irregular limiting plate of the hepatocytes with associated hepatocyte apoptosis and inflammatory infiltrate. Bile ductal injury and mild vasculitis may be present in the portal tract. However, loss of bile ducts or severe vasculitis is exceedingly rare in chronic hepatitis C.
Interface hepatitis caused by extension of portal inflammation into lobules. Besides the interface hepatitis, the histological findings also include spotty acidophil bodies and lymphocyte infiltrates in the lobules. There are hypertrophic Kupffer cells associated with necrotic hepatocellular debris. More severe lobular activity may suggest an exacerbation of the chronic hepatitis or superimposed acute hepatitis of another etiology. Another characteristic but nonspecific feature is mild fatty change. It is more common in hepatitis C than other forms of chronic viral hepatitis. Different than the zone 3 accentuated steatosis seen in metabolic syndrome, chronic hepatitis C–related steatosis is typically randomly distributed. In the posttransplantation setting, it can be difficult to distinguish recurrent hepatitis C from acute cellular rejection. Endotheliitis and lymphocytic cholangitis can be seen in both conditions. In hepatitis C, the endotheliitis is usually mild. In contrast, acute cellular rejection has more severe endotheliitis. Persistent inflammation and hepatocellular injury lead to the fibrosis. Progressive interface hepatitis is followed by periportal fibrosis and portal-to-portal and even portal-to-central bridging fibrosis. The bridging fibrosis and regenerative nodule of the hepatocytes significantly distort the normal architecture and result in cirrhosis. Several scoring systems to evaluate the necroinflammation (grade) and fibrosis (stage) for chronic hepatitis have been proposed. The most common include Metavir, histologic activity index (HAI, also known as the modified Knodell or Ishak score), and Batts & Ludwig scheme. In general, grading is based on portal inflammation, interface hepatitis, lobular inflammation, and necrosis; staging is based on the extent of fibrosis. The results are comparable from different scoring system. An example is the Batts & Ludwig scheme (below). Studies have been conducted to explore the immunohistochemical marker. However, commercially available and universally reproducible antibodies for HCV immunohistochemistry are still lacking. Factors associated with successful therapy with interferon and ribavirin include genotypes other than 1, lower baseline viral levels, less fibrosis or inflammation on liver biopsy, and lower body weight or body surface area. [Guideline] Recommendations for prevention and control of hepatitis C virus (HCV) infection and HCV-related chronic disease. Centers for Disease Control and Prevention. MMWR Recomm Rep. 1998 Oct 16. 47(RR-19):1-39. [Medline]. NIH Consensus Statement on Management of Hepatitis C: 2002. NIH Consens State Sci Statements. 2002 Jun 10-12. 19(3):1-46. [Medline]. Barrera JM, Bruguera M, Ercilla MG, et al. Persistent hepatitis C viremia after acute self-limiting posttransfusion hepatitis C. Hepatology. 1995 Mar. 21(3):639-44. [Medline]. Farci P, Alter HJ, Wong D, et al. A long-term study of hepatitis C virus replication in non-A, non-B hepatitis. N Engl J Med. 1991 Jul 11. 325(2):98-104. [Medline]. Tong MJ, Lai PP, Hwang SJ, et al. Evaluation of sexual transmission in patients with chronic hepatitis C infection. Clin Diagn Virol. 1995 Jan. 3(1):39-47. [Medline]. Yano M, Kumada H, Kage M, et ak. The long-term pathological evolution of chronic hepatitis C. Hepatology. 1996 Jun. 23(6):1334-40. [Medline]. Takahashi M, Yamada G, Miyamoto R, Doi T, Endo H, Tsuji T. Natural course of chronic hepatitis C. Am J Gastroenterol. 1993 Feb. 88(2):240-3. [Medline]. Nanba S, Ikeda F, Baba N, et al. Association of hepatic oxidative stress and iron dysregulation with HCC development after interferon therapy in chronic hepatitis C. J Clin Pathol. 2016 Mar. 69(3):226-33. [Medline]. Previsani N, Lavanchy D. Hepatitis C. WHO (2002). Available at http://www.who.int/csr/disease/hepatitis/whocdscsrlyo2003/en/index.html. Accessed: October 1, 2010.